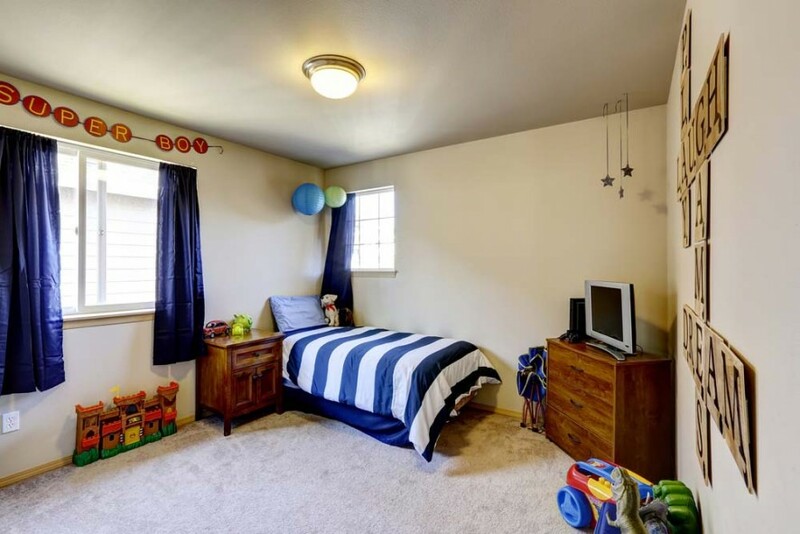 This traditional boy’s bedroom is adorable, simple, and effective. Bold blue colour packs a punch and the dark wooden features are masculine and strong. There is plenty of storage and space to play, with a red feature stripe for added colour impact. The blue and turquoise colour palette in this room gives a nod to the ocean, but it’s the wooden half poster bed that makes the bed appear like a ship in the middle of the sea that gives the room its true adventure appeal for children. 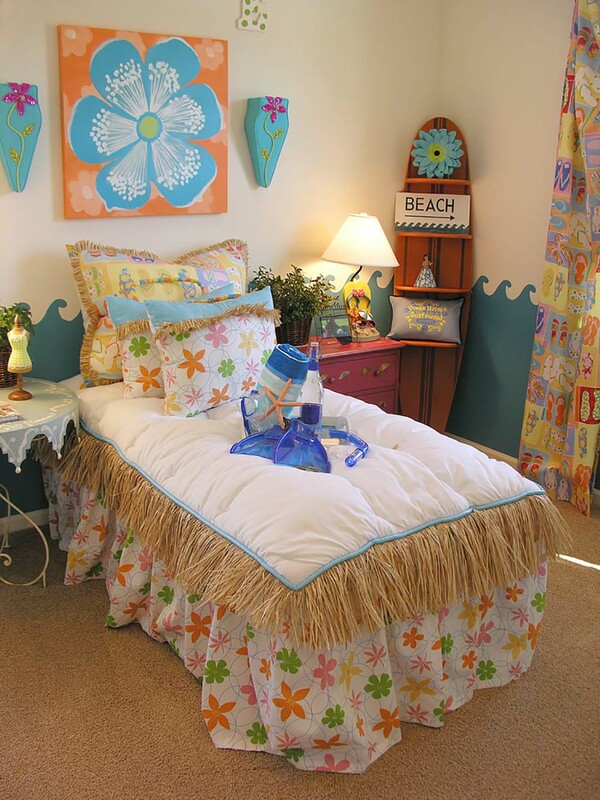 Decorators have put a lot of thought and effort into ensuring that this room filled with fun and adventure is the perfect place for any youngster with an imagination. Wall murals add charm, but the boat bed centrepiece makes the room truly unique and inspiring. Soft furnishings made from blue fabrics and furniture built from traditional dark wood make this boy’s bedroom typical and fun, but the cream backdrop means that the temporary design features can be updated simply as the child grows and his tastes develop. This soft pink and delicately decorated bedroom is fit only for your little princess. Accentuated with other pastel tones, the powdery pink tones aren’t overpowering, but a perfect feminine match to the ornate furniture. Muted tones in this room don’t take away any of its charm. 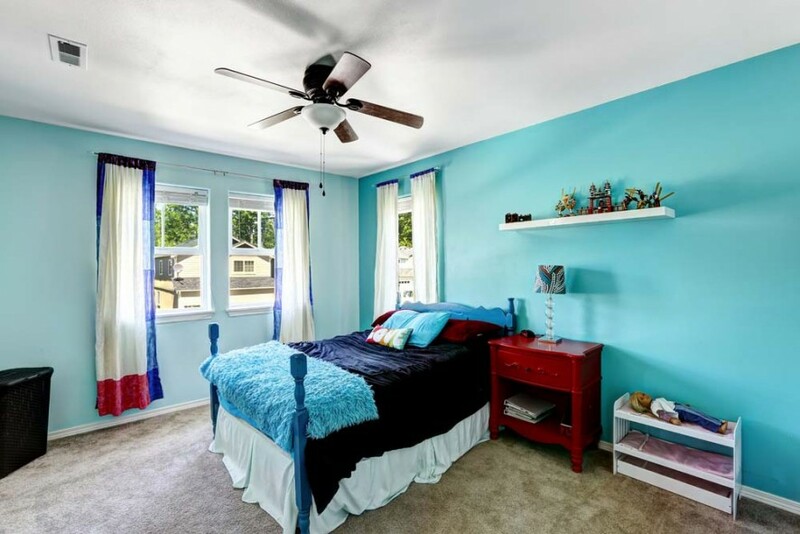 Although the colours are more subtle than the ordinary teenage bedroom, it provides the perfect atmosphere for relaxing, concentrating, and unwinding. One of the most important features in any child’s bedroom is storage. For clothing, toys, games, and school items, you can never have enough. This wonderfully bright bedroom employees a complex and stylish colour palette that isn’t disrupted by mess due to ample storage in furniture and built into the bed. 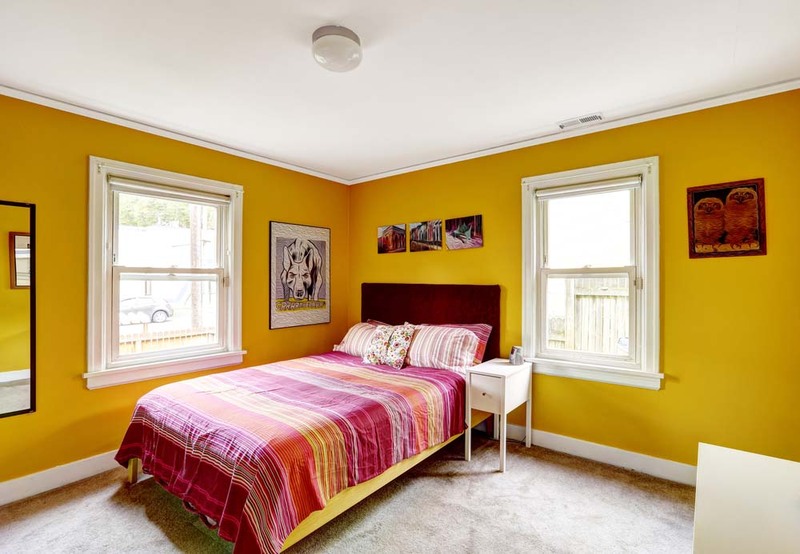 For an instant dash of happiness when your teenager enters their room, cover all walls with bright yellow paint. 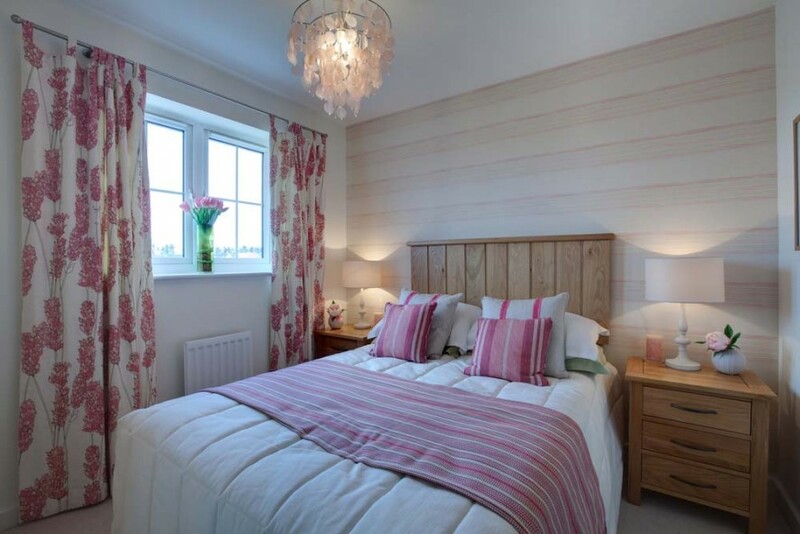 Provide a contrast with other warming colours like pink and orange, but remember that you can tone down the room with flashes or white and cream. 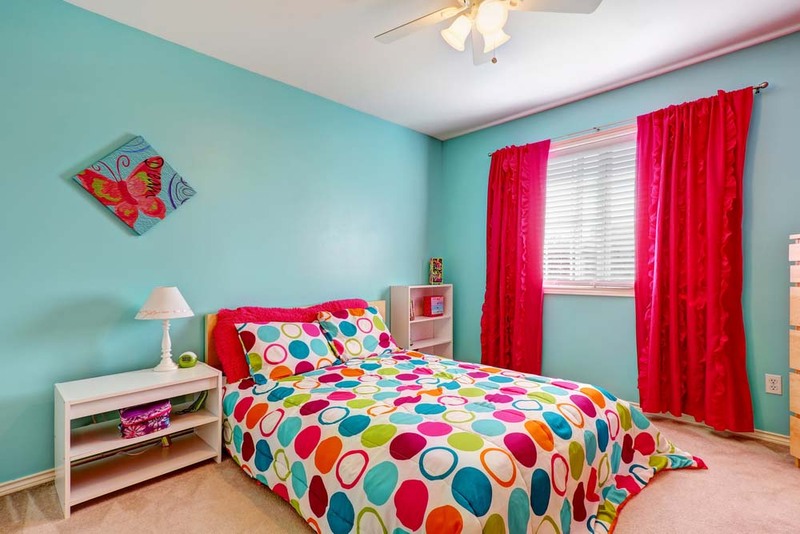 For the quintessential female child’s bedroom, get out the bold pink paint and cover all four walls. These pink and black wall motifs add personality, style, and flair. Turquoise is a wonderful colour that is fun, but isn’t overpowering and still brings cooling and calming qualities to any room. Amplified by the contrasting pink and oranges, which stand out and increase the fun in the room, blue provides a perfect base colour. 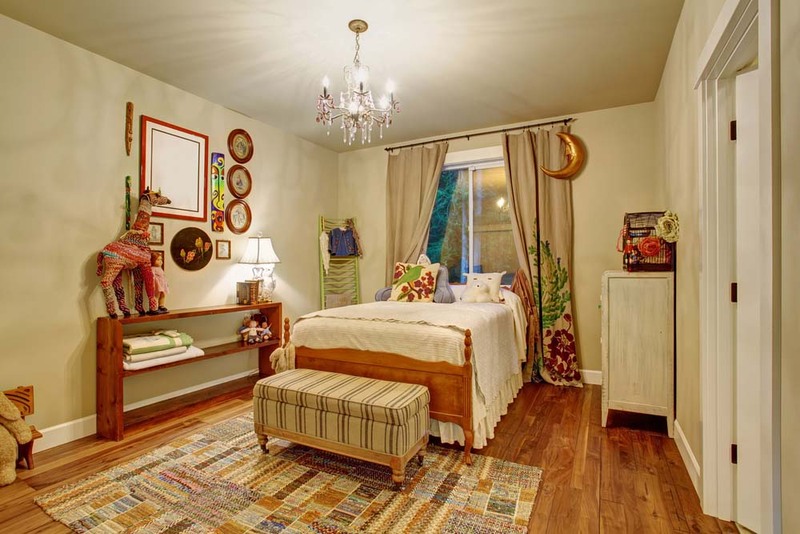 This child’s bedroom is proof that you don’t have to sacrifice style for fun and colour. A very bold lime green colour palette looks fantastic in a very cool and contemporary room with sleek furniture and modern lighting. The addition of the small football adds instant personality and fun. If comfort is the most important thing for your child and you want to fill their bedroom with lots of comforting furnishings for a homely and loving feeling, providing lots of bold print and ruffles can add more dimension to the room to prevent that empty feeling, but the addition of lots of cushions is your opportunity to really pack in lots of colour and prints. Mixing blue and gold isn’t a popular trend, but it’s certainly understated.  Using muted versions of each colour provides a softer colour palette with less contrast. 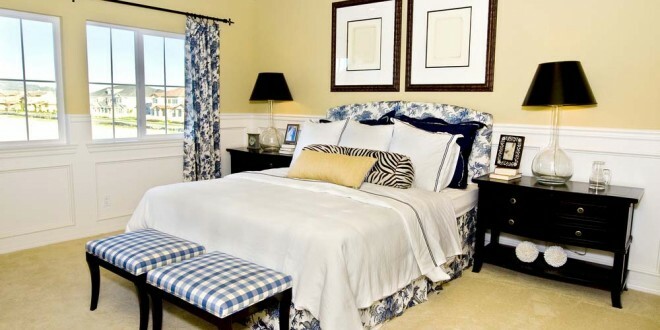 Combining blue and yellow give the room a soft, summer atmosphere. 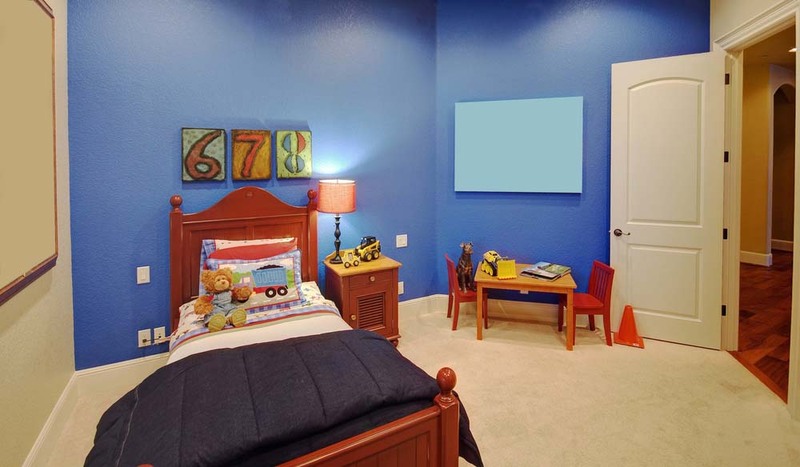 This modern bedroom provides everything any child or teenager needs in their own personal escape. Modern and stylish furniture, separate zones for relaxing, studying, spending time with friends, and sleeping, and lots of colour and shape for fun and depth. 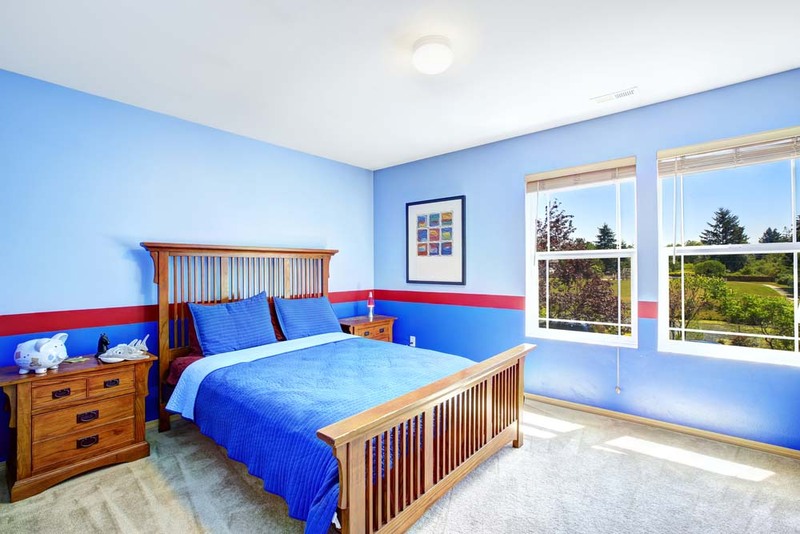 If your young one likes to sleep and dream, this is the perfect room for letting their imagination run wild. 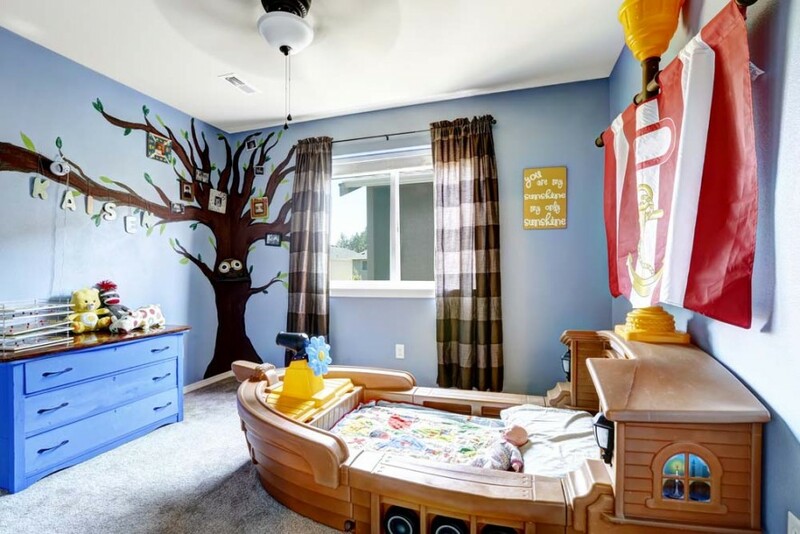 A pale colour palette lets them to paint the room using their imagination, guided by quirky and personal touches like photos, toys, and decorations. This modern and industrial style is a unique twist on the usual feminine child’s bedroom. 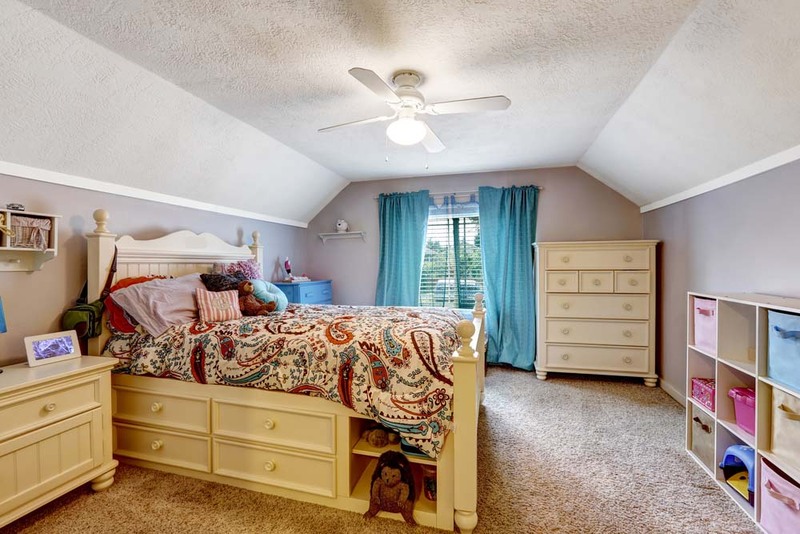 With a raw brick wall and a minimal wooden bed frame, this room has everything needed to create a cool and stylish twist on a young girl’s bedroom. 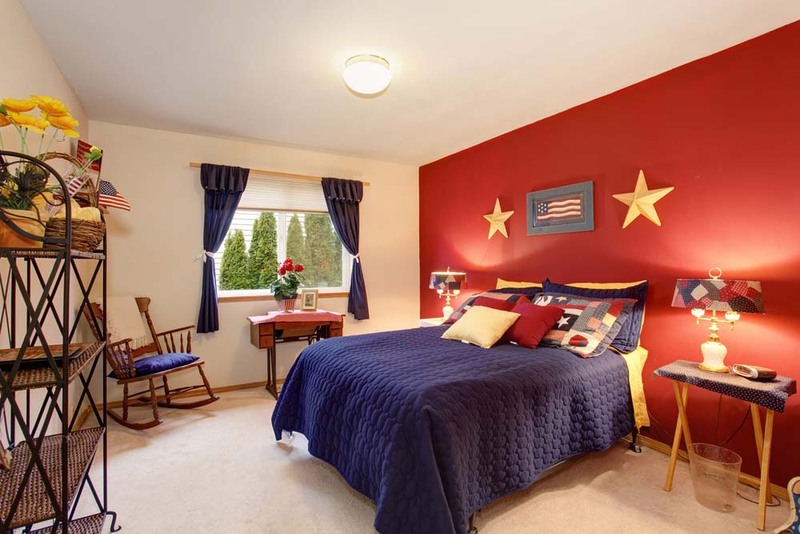 This patriotic bedroom celebrates US life and decorates to that theme throughout the room, but in a way that is subtle and stylish, but still carries a traditional and patriotic appeal. This peaceful and pretty bedroom feels like the perfect transitional bedroom for an older teenager wanting to hold onto some young feminine charm, mixed with adult sophistication and a mellow colour palette. Fancy packing a rainbow into your child’s bedroom but aren’t sure how to manage the colour impact? 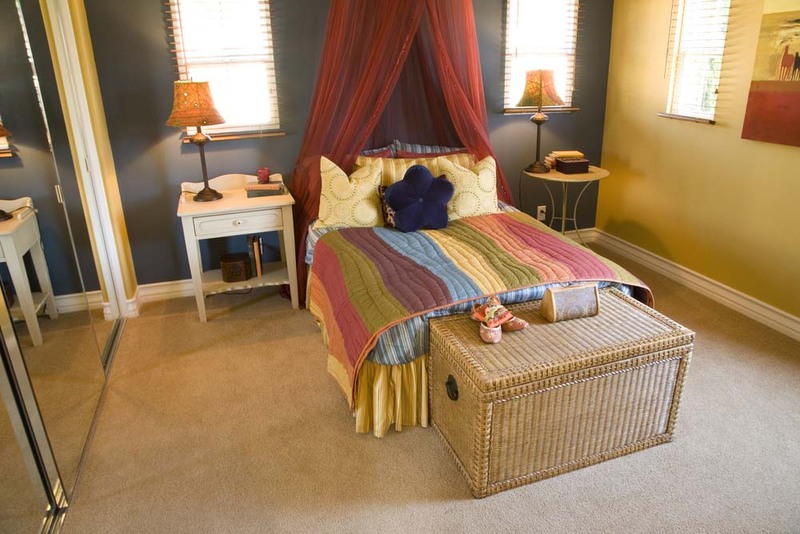 This muted bed cover features a muted rainbow tone that is interesting, charming, not overpowering, but still remained the main feature of the entire room. For a charming twist to this charming little girl’s bedroom, two living plants have been added to bring more texture and a new colour into the room. Light green lighting and background features match, and the room benefits from an unusual but gorgeous pink and green colour palette. Although this bed looks slightly small in comparison to the size of this room and the minimal attitude to furniture, this little boy has plenty of space to play and let his imagination run wild, either alone or with siblings and friends. 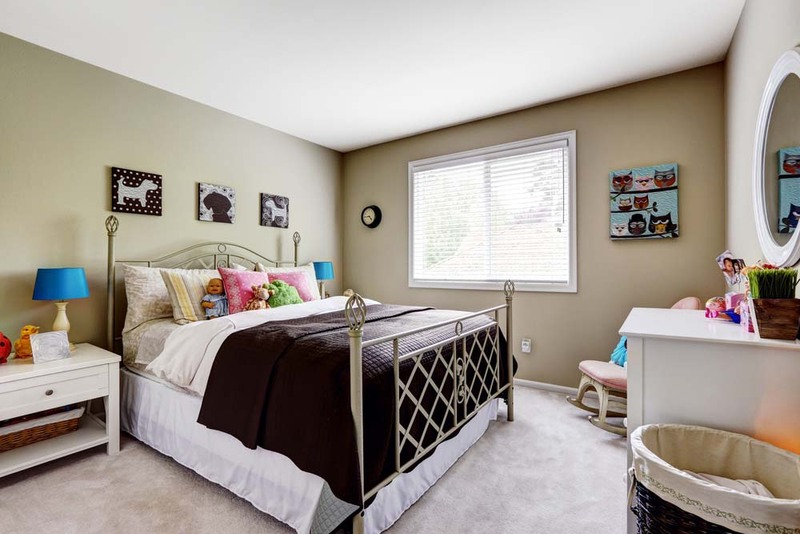 This grand and extravagant bedroom is perfect for a growing young girl who needs space to play and entertain. There is space for storage and studying, but the main element of this room is the circular layout and fabulous views. The pink and white layout makes it ideal for your little princess.